NEW YORK--(BUSINESS WIRE)--More than half of financial advisors (56%) believe that annuities are an important part of a retirement plan, but nine out of ten (90%) find it difficult to address client needs using a “one-size-fits-all” approach with a single type of annuity. 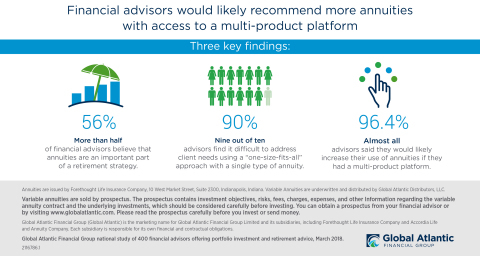 Of these advisors, almost all (96.4%) said they would likely increase their use of annuities if they had access to a multi-product platform and distribution partners who could help select the best strategies based on client objectives. These are some of the major findings of a Global Atlantic Financial Group national study of 400 financial advisors offering portfolio investment and retirement advice. The study was conducted in March 2018 by Echo Research, a global market analytics firm. When asked about the benefits of a multi-product annuity platform, the majority of advisors (57%) said it allows for customizable retirement planning based on client need and lifestyle, and half (51%) noted the simplicity of a single point of contact for multiple product offerings. “In this volatile investing environment and with a new era of regulation as a backdrop, advisors need to show clients that they have a full set of solutions at their disposal to meet income planning and retirement savings needs,” said Paula Nelson, President, Retirement at Global Atlantic Financial Group. The survey also revealed the need for more advisor resources and investor education. While three-quarters of advisors (76%) believe they have a strong understanding of annuities, nearly two-thirds (62%) say their clients do not have a very strong understanding of the product. When asked how they educate their clients, most advisors (62%) said they spend time to explain product features and answer questions. About half (53%) use written materials supplied by partners or their company. When asked what would help them better utilize annuities among clients, half (50%) said better guidance and education from distribution partners on the differences between products, and nearly half (46%) would like the ability to withdraw from the annuity’s value for emergencies. Less than one-third (31%) cited a desire for fee-based rather than commission-based annuities. The 2018 Global Atlantic Financial Advisor Survey was completed online by Echo Research in March 2018, among 400 financial advisors who offer portfolio investment and retirement advice that includes annuities. The surveyed financial advisors work at full-service brokerages, wirehouses, banks, registered investment advisors, and independent and regional broker-dealers. The margin of error for this sample +/- 4.9% at the 95% confidence level. This material is authorized for distribution only when accompanied or preceded by a prospectus for the annuities being offered. The prospectus contains investment objectives, risks, fees, charges, expenses, and other information regarding the variable annuity contract and the underlying investments, which should be considered carefully before investing. You should read the prospectus carefully before investing money. Global Atlantic study finds that financial advisors want more annuity options and better investor education from annuity providers.